It's simple! Season ticket holders unable to attend a particular game can donate tickets to MVK in a matter of minutes by logging on to our website. Tickets can be submitted after completing a one-time registration providing a donor password. All ticket donors are automatically issued a tax deductible receipt. The MVK website also serves as the location for qualified, child focused non-profit organizations in the Washington,D.C./ Maryland/ N.Virginia Areas to receive donated tickets, as well as nonprofit agencies serving injured soldiers, active military, and their families. Non-profit organizations choose a password in the same manner as ticket donors, providing qualified organizations with the chance to receive donated tickets. Once the ticket information is compiled in the MVK database, the non profit partners are notified of the donation via email, and tickets are then claimed on a first come, first served basis. Once claimed, tickets are picked up from the donor and delivered to the recipient prior to the event. 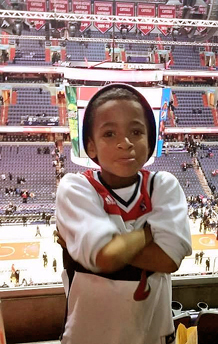 This cool Most Valuable Kids recipient witnessed the Wizards beat Lebron and the Cavs! What a game!